Sweet potatoes are pretty much in season all year round. Bake it, roast it, boil it, puree it. Whichever way you may prefer but have it. Sweet potatoes contain twice the amount of dietary fibers compared to a normal potato. It is rich in beta carotene, contains large amounts of Vitamin B6 which is beneficial in breaking down homocysteine (which contributes in hardening the arteries and blood vessels). It contains a great amount of manganese and also is rich in Vitamin C and E. This humble, staple root is easy to cook and tastes great with a drizzle of lemon, salt, pepper or chilli powder. My injured foot has stopped my trip to the market for a few days but Simon, the veggie guy bought some sweet potatoes from the market a few days ago. He kept on insisting I buy them, trying to convince me that its really good for health but his intention was to get rid of the huge quantity that he had bought! Instead of baking them I decided to make a sabji (vegetable) out of it. I remember my mum use to make it quite often to go with other curries or vegetables. This is one sabji that I enjoy when I fast on Ekadashi days. I have a bowlful with some yogurt and I don’t add any turmeric powder. Its filling and healthy too. Adding fennel seeds gives this sabji or shaak a different taste. Adding lemon juice balances the sweet taste of the potatoes. Peel and cut the potatoes and keep it in the water till required. When it becomes hot, add the cumin and fennel seeds, chillis and ginger. Saute for a few seconds and add the cubed potatoes. Add salt and mix it well. Cover the pan and cook the potatoes over low heat till done. Stir occasionally and don’t overcook the vegetable as it will become mushy. When the potatoes are cooked, add lemon juice, mix gently. Garnish with chopped fresh coriander and serve immediately with hot chappatis or parathas. Can use this recipe for ekadashi. Omit turmeric powder. If serving this dish to small children, then avoid chopped chillis. Grease your hands with a little oil before peeling and cutting sweet potatoes. If the sweet potato is not cooked and begins to stick to the bottom of the pan, add 2-3 tbsp of water. The steam created will help to cook the sweet potatoes. Sweet potatoes are healthy and I somehow love these in any form . My favourite is the chat with spicy masalas . Love this version too , will give it a try . Simple yet tasty; great for everyday cooking!! So right sweet potato much healthier, glad you bought them from Simone. Beetakuri nu saak is my hubby's favourite 🙂 so delicious. I rarely cook sweet potato like this. Will have to try this healthy & delicious curry. We make sweet potato curryin different way, and this simple dish looks fabulous and easy to cook. We all love sweet potatoes. Even more than regular potatoes. This is such a comforting dish that I could eat any day and it is so quick to make. I never cook sweet potato for curry. Sounds interesting. 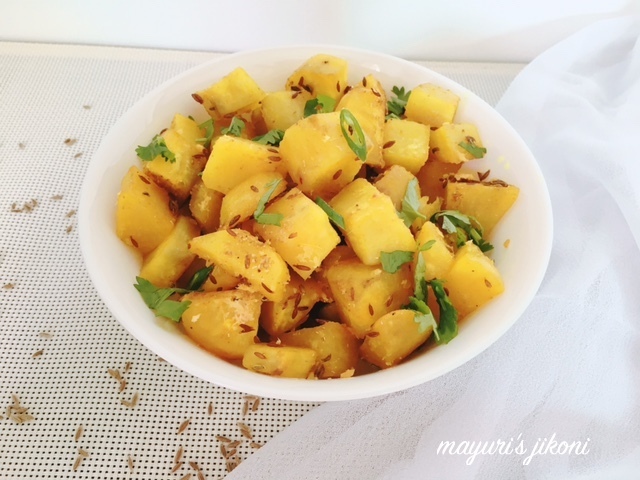 My kids love this sabji. Thanks for reminding me ! I also learnt this recipe from the blogging world and now love this.